= Nee, migi kara mittsume no omocha to nibanme no hikidashi ni aru oyatsu, motte kite. = Hey, can you bring me the third toy from the right and snacks in the second drawer? Today we have シェイディー先生 ( = Shady sensei) here from Edinburgh to teach you Japanese. = Konnichiwa! Shady desu. Oboete iru? Mata modotte korarete ureshii desu. = Hello! I’m Shady. Do you remember me? I am happy to be back here. = Kore wa boku ga gesuto sensei to shite oshieru futatsume no ressun desuyo. = This is my second lesson as a guest teacher. Today I will teach you how to indicate ordinal numbers in Japanese. As many of you already know, Japanese counters are a bit complicated. You have to change counters when you count things/people. Note: We often use regular numbers instead of kanji. ★Please go study Maggie Sensei’s counter lesson if you are not familiar with these. OK, today I’ll teach you suffixes, 目 ( = me). You add 目 ( = me) after a counter to indicate order. Ex. 何行目 ( = nangyou me) = which line? = Yuubinkyoku wa doko desu ka? = Where is the post office? = Massugu itte, mittsume no shingou wo hidari ni magatte kudasai. Soko kara ipponme no michi wo migi ni magatta kado ni arimasu. = Go straight and turn left at the third traffic signal and turn the first street to right and you will find it on the corner. = Anmari osake, nomanai hou ga iiyo. = You shouldn’t drink too much alcohol, you know. = But this is just the first glass. = Soredewa juugyoume kara yonde kudasai. = OK, then please read from the 10th line. = Nijigenme to sanjigenme no aida ni kyuukei jikan ga juppun arimasu. = There is 10 minute break between the second and the third period. ＝Rakkii! Konsaato, ichiretsume no seki ga toreta yo. = I got lucky and got a first-row seat for the concert. = DVD pureiyaa sugu kowarerun dayo ne. Kore de mou sandaime dayo. = You know DVD players break easily. This is the third one. = Migi kara futatsume no keiki wo kudasai. = Please give me the second cake from right. = Omedetou gozaimasu! Okyakusama wa kono omise no senninme no okyaku sama desu node kochira no shouhin wo sashiagemasu. = Congratulations! You are our 1000th customers so we would like to give you this prize. = Maggie Sensei no saito wa kotoshi de rokunenme wo mukaemashita. = Maggie Sensei’s site has entered its 6th year this year. = Mom, can I have seconds? = Kore de gohan sanbaime yo. = But this is your third bowl of rice. = Nihongo nouryokushiken no nikyuu, muzukashikatta? = Was the JLPT N2 level difficult? = Sankaime de yatto ukatta yo. = I barely passed it the third time. = Misshion inpposhiburu shiriizu no nansakume ga ichiban omoshiroi to omou? = Which episode of Mission Impossible series do you think is the best? = I guess the second one. What do you think? = I am drunk ..
= Ikkenme kara sonnani yotte itara asa made motanai naa. = If you are that drunk from the first bar, you won’t make it through until tomorrow morning. = These rice balls are delicious! = Sore de nanko me? = Counting that one, how many have you had? = It’s the fifth one. = Hamamatsu wa ikutsume no eki desu ka? = How many stops from here to Hamamatsu? = Nihon ni kite, kyou de nannichime desu ka? = Including today, how many days has it been since you got to Japan? = Kyou de, toukame desu. = Shousaiwa ichimaime ni kaite arimasu. = All the details are written on the first page. ★ Number + 番 ( = ban): When you simply tell a number. To make a question: 何番 ( = nanban) Which number? = Ichirou no sebangou wa gojuuichi ban desu. = Ichiro’s uniform number is No. 51. = Bangoufuda, juuban wo omochi no kata, niban kauntaa e okoshi kudasai. = A customer who has No.10. Please go to the counter 2. Note: 一番( = ichiban) means “No.1” or the best / the most ~ . = Maggie Sensei wa ichiban desu. = You are the best, Maggie Sensei! = Shady Sensei wa ichiban, kawaii sensei desu. = Shady Sensei is the cutest teacher. = Toukyou iki (or yuki) no shinkansen wa nanban sen kara demasu ka? = What (Which) track does the Shinkansen (bullet train) for Tokyo leave from? = Kurasu de niban no seiseki datta. = My grades are the second best in the class. = That girl is cute! = Mae kara nanbanme no ko? = Counting from the front, which girl? = Mae kara sanbanme no ko. = The third girl from the front. = Dono ha ga itai no? = Oku kara nibanme no ha ga itai desu. = The second molar from the back hurts. = Boku wa kurasu de yonbanme ni se ga takai. = I am the 4th tallest in the class. = Kono CD no rokubanme no kyoku, kiite mite. Sugoku iiyo. = Please listen to the 6th song of this CD. It’s really good. = Kono ko wa shitakara nibanme no ko desu. = This boy/girl is my second youngest child. = Nihon de nibanme ni takai yama wa Kitatake desu. = The second highest mountain in Japan is Kitatake. = AKB wa “Kurasu de juubanme ni kawaii onna no ko” wo atsumeta to shite iru. = It is said that AKB gathered “the 10th cutest girls in the class”. = Wain, sore de nanbonme? = How many bottles of wine have you had including that one? 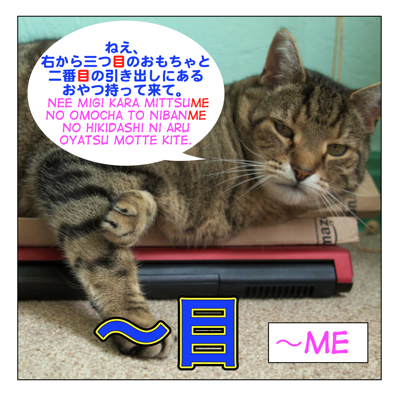 Note: There is no equivalent interrogative word for “何 ( = nan) + counter + 目 ( = me)” / “何番目 (= nanbanme) ” “いくつ目 ( = ikutsume)” in English. So it is kind of difficult to translate them in English. = Nihon ni nankai, kita koto ga arimasuka? How many times have you come to Japan? You want to know the number of trips to Japan in total. = Nihon ni kita nowa kore de nankaime desu ka? How many times have you come to Japan including this trip? You can’t translate this sentence directly but what you want to know is ” this trip is the ~th time to come to Japan”. = Kore de sankaime desu. = This (trip) is the third time. = Obama wa dai yonjuuyon dai no amerika gashuukoku no daitouryou desu. = Obama is the 44th President of the United States. = Soredewa dai ichiji shiken wo hajimemasu. = We now start the first stage exam. = Kono kyoku no dai ni gakushou ga subarashii. = The second movement in this song is wonderful. = Toshi no kure ni naru to naze ka nihon dewa beetooben no daiku wo yoku mimi ni shimasu. = We hear Beethoven’s Symphony No.9 a lot at the end of the year in Japan for some reason. = Sore dewa dai nanakai, nihongo benron taikai wo hajimemasu. = Now we will start the 7th Japanese speech contest. = Shuukanshi ni “Hikaru ga dai nishi wo shussan” tte kaite atta yo. = The weekly magazine says “Hikaru just had the second child”. = Dairokkan de kare ga uso wo tsuite iru to wakatta. = My sixth sense told me that he was lying. = Sotsugyoushiki ni sukina danshi no seifuku no dainibotan wo moratta noni kekkyoku tsukiawanakatta. = Even though a boy I liked gave me the second button from his uniform at our graduation ceremony, in the end we didn’t go out. It is a kind of romantic custom to get the second button of the school uniform from a boy you like on their graduation day. = Thank you Shady Sensei! = Mata issho ni oshigoto ga dekite ureshikatta desu. = I was very happy to be able to work with you again. = Tabun, kono ressun wa, kono saito no sanbyaku rokujuu hachiban me no ressun ni naru to omoimasu. = I think this lesson is maybe the 368 th lesson on this site. How to say 1st week, 2nd week ? Can you say it without 第? Yes, a lot of people omit 第 in conversation. I have still some problems in using ban and banme. My grades are the second best in class. KURASU de niban no seiseki datta. I am the fourth tallest person in class. Boku wa kurasu de yonbanme ni se ga takai. How can i transform the first sentence to express i am the second best pupil in class, just as the second sentence? Do i have to use “nibanme” then? I came here looking for a bit of information on using ‘目’ as a counter and now I have a lot to read through! But I only got a few sentences in before I got confused why 一本目 (and not 一つ目) was used to say ‘first street’, but now I understand ‘本’ is used to count long, cylindrical objects. I had only seen this used before for bottles, etc., but I guess it is used for streets as well. My question really is – as there are so many different counters in Japanese – would a Japanese speaker understand what I meant if I said, for example, 一つ目の道? And yes! Japanese people do understand if you say 一つ目の道. The counter of 一つ、二つ are general way to count things. Hi, sensei! That’s my first comment here! It is a very conversational phrase. You often skip ところの in conversation. Wow! I am so grateful for your message in Portuguese. In this case, is it acceptable to use both 第 and 目 together? Thank you for spotting it*. Though it is said in the newspaper, I think it is redundant. It will be better just to say 第４４代 or ４４代目. I will fix it and add some note. My textbook has numbered lessons but also has numbered sub-lessons. How would I say, “Lesson 4, section 3”? I know lesson 4 is “daiyonka”, but I don’t know how to deal with the other part. how could you say 1 out of 10 people? So, as far as I understand you use 番目 to say that something is e.g. the first in or from something. So when I want to say, give me the book from the bookshelf I would have to use that. But if I just say I am reading the first book, I use number+counter+目. Furthermore counting from 10 upwards I have to use 番目 since 目 is only for the numbers 1-9 (I read this on another website). But what if my word doesn´t have its own counter, like child? As in the example below I just use what´s most associated with this word, so 一人目の子? Why is 一本目 translated as second street and not first street here? number+counter+目 Furthermore counting from 10 upwards I have to use 番目 since 目 is only for the numbers 1-9 (I read this on another website). → You can use whatever number. 2. Or really? Then it is a mistake. 一本目= should be the first street. what is the difference between ban and gou both means number and how can I use gou? 番 is used when you simply count a number from the top. 号 is more limited. You use 号 for the issue, edition, address of an apartment/house, etc. Also you use it for a model name. I was wondering how do you say “Happy 21st birthday!” in Japanese? Or It’s my 21st birthday? Which counter would I use? soko kara ipponme no michi…” :rrrr:　sore or soko? 2. １０００番目のお客様 – If this is correct, 人 is missing, which means you can’t use counters with 番目, right? 3. 第１０００人のお客様 – If this is correct, 目 is missing, but could you add it after 人? Also, some of your examples for 第 don’t have a counter, (第２ボタン, 第二子) so could I omit the counter in this case, ie 第１０００お客様? I am puzzled about the に after 第目, I was expecting a の. Does it have something to do with the adjectives that are following? Thank you for spotting the typo as always. I really appreciate it. 2. It is not wrong to say 1000番目のお客様. I guess 〜人目のお客様 is more common. 前から１０番目の女の子 = the 10th girl from the front. The”とき” I was mentioned was referring to “when” in English. Sorry for the late reply. I was away for a week. off. No, I don’t have “when” lesson. But someone else asked me to make a lesson so I will add it on the list. Kore ga boku ga gesuto sensei to shite oshieru [futatume]—> futatsume no ressun desuyo.